Select Printer: Allows you to choose a default printer. Printer Type: Allows you to specify the brand of printer being used. Choose the "Other" option if you do not see your printer type listed. Yes: When a client checks-in through the POS Check-In window a sound will play for either valid or invalid check-in. No: No sounds will play when a client checks-in with the POS Check-In window. 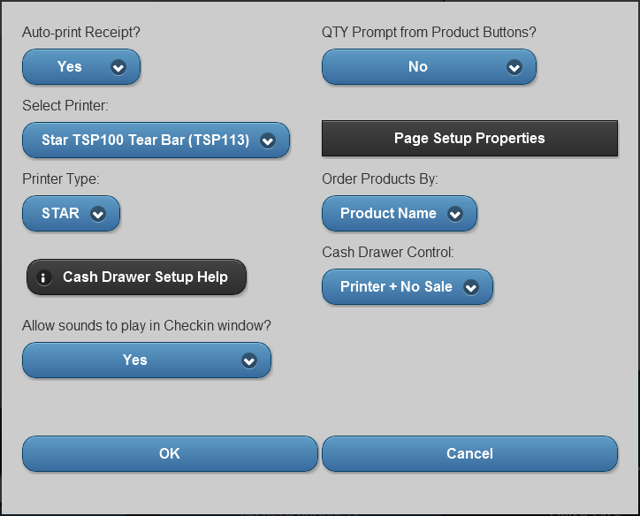 Page Setup Properties: Allows you to setup your printer's page setup properties. Default: Products will be listed in the order they were entered into the system. Product Name: Products will be listed in alphabetical order. Price: Products will be listed in price order (low value to high value). Disabled: The cash drawer will only open when a receipt prints.